Our local supermarket had hake on offer, and this huge lot set us back a mere £2. I haven’t done a Friday Is For Fish recipe in a really long time, so it’s really disappointing for me when the photos I take don’t come out as nice as I’d like them to. This week, I made some steamed fish, Chinese-style, which I was really looking forward to sharing with you… I don’t think my pictures do the dish justice, and I’m very sorry about that, but I hope you won’t let the pictures put you off too much. 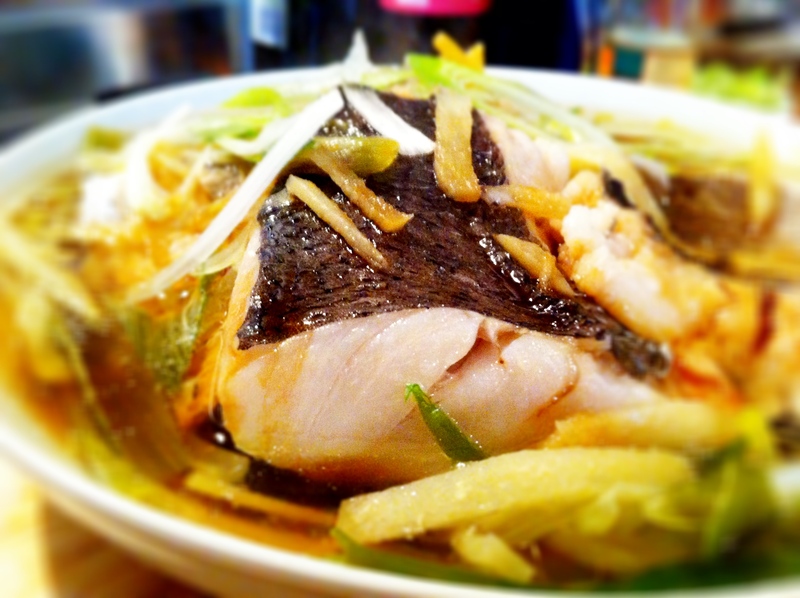 Steamed fish is something families eat a lot of in Asia. While it’s normally the cakes and desserts that get the ‘oohs’ and ‘ahhs’ at restaurants here, I remember the steamed fish as the dish that would get that kind of response at a Chinese dinner table (or similarly when they serve suckling pig at a special occasion like a Chinese wedding banquet). 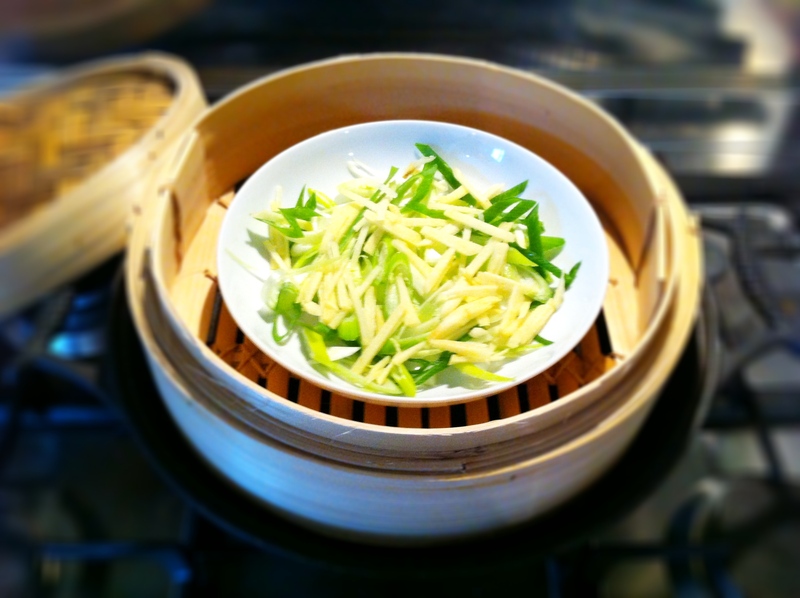 Start by creating a bed of spring onions and fresh ginger over your steamer. 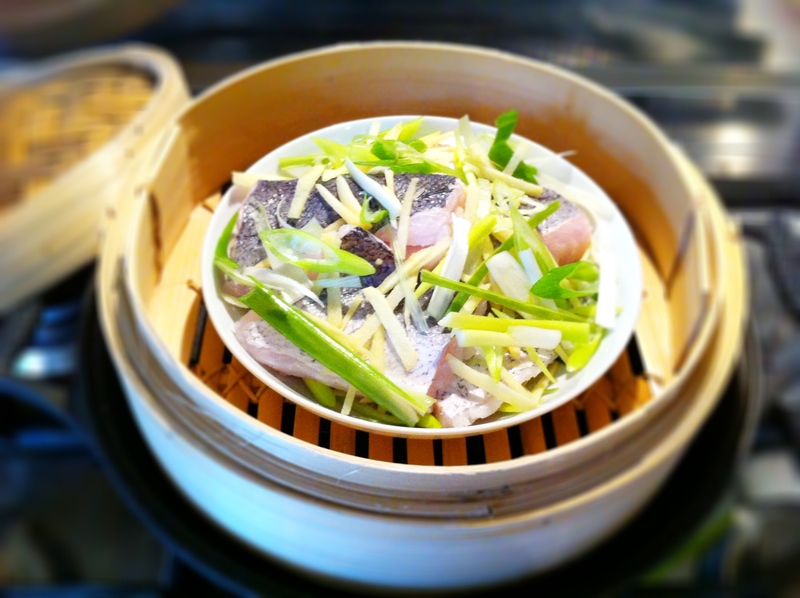 The steamed fish is normally brought out to the table as one of the later dishes, and it’s usually presented with a kind of flourish, like a pièce de résistance, when you order it at Chinese restaurants. Quite funny really; but that kind of ceremony is, for me, understandable because steamed fish, Chinese-style, is simply divine. D.I.V.I.N.E. It’s all about the marriage of a mere handful of ingredients – good fresh fish, fresh ginger, fresh spring onions, some soy and sugar, and some heated oil brought together by the genteel magic of the steaming process. Its simplicity is what makes this recipe so unique and so special– the steaming process helps the ginger and spring onions release their flavours and the fish ends up almost gently poached in these juices. All it takes is some searingly hot oil poured over the fish followed by the soy to create its own unique sauce. I stick to soy and sugar because it works though you can try adding any myriad of flavoured soys as well. Then place your lightly seasoned fish fillets skin side up on top of your bed of herbs. I don’t have a wok or steamer large enough to steam a whole fish (head and all) so, sadly, I tend to have to use fillets – a fully boned fish would have provided so much more flavour, but that’s what I have to miss out on sometimes. We bought this hake at our local supermarket and it cost us a mere £2 for what came up to about 450 grams of fish – a not so insignificant amount! All this dish needs is a bit of plain white rice and some yummy vegetable side dishes, which I think makes this one of the healthiest meals around. If you’ve never tried this style of steaming fish before, please do because I think it’s truly awesome. 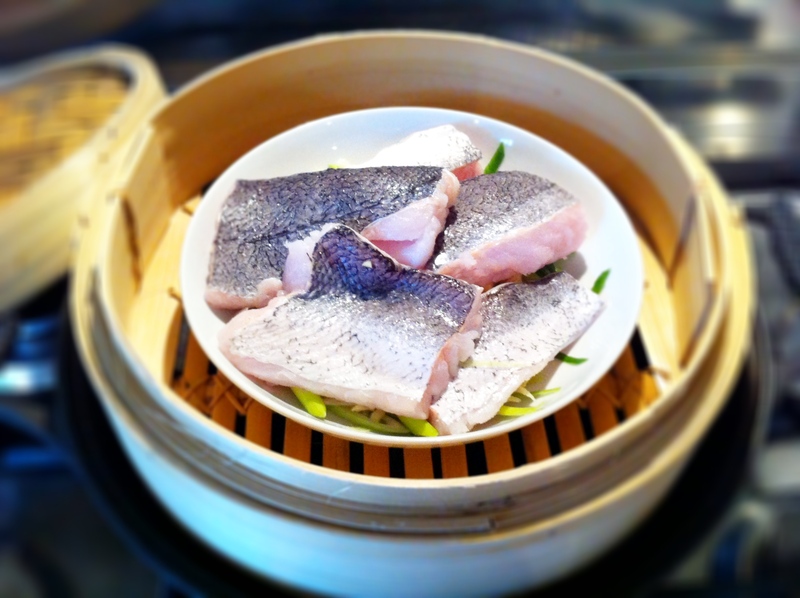 Steamed fish (hake this time), Chinese-style. The best thing about this dish is once it’s cooked, you can eat everything that’s in the bowl – the fish, the softened ginger/spring onions, the sauce, EVERYTHING! Click here for a printer-friendlier recipe card. 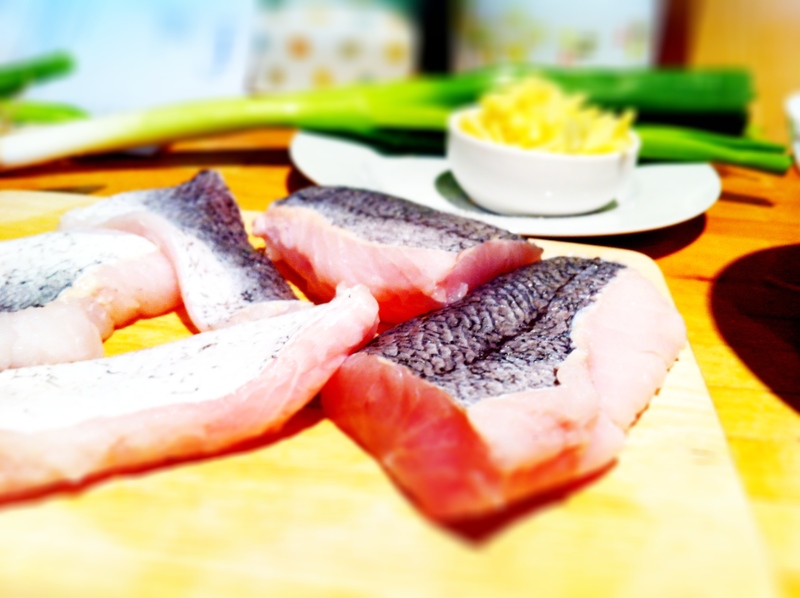 Prepare your fish by making sure it’s de-scaled, washed and then dried. In your steaming bowl, lay down ¾ of your fresh ginger and spring onions. Season the flesh side of your fish with salt and finely ground white pepper, then lay your fish flesh side down onto the bed of ginger and spring onions. Top the fish with the remaining ginger and spring onions (retain a few spring onions to use as a garnish when the dish is done). Steam the fish for 10-15 minutes until cooked through. While the fish is steaming, heat your oil in a small saucepan until very hot, and in a separate bowl, dissolve the sugar in your soy sauce. 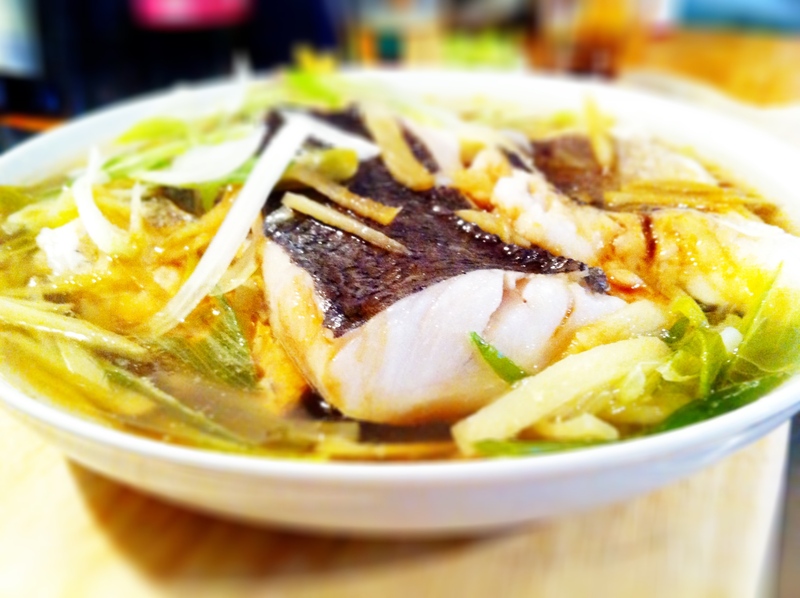 When the fish is cooked, you’ll find that steaming, ginger and spring onions will have released a lot of liquid into your bowl – don’t tip this out because this broth is like liquid gold! When your fish is cooked and your oil is heated to very hot, brush away some of the spring onions and ginger off the top of the fish (push them to your side of the dish) and carefully pour the hot oil over the skin of the fish – it will splutter a little bit so be careful! Then pour your sweetened soy sauce over the fish, garnish with some fresh spring onions. It’s best eaten hot with nothing more than some plain white rice and vegetables. I need to try your version of steamed fish, and SOON. I like the finishing touch of oil and soy. Hi Claire, my father makes a proper marinade to pour over the fish after the oil but I keep it simple with just some plain soy. If you have a preferred sauce, even teriyaki, it’ll work just as well. £2 for 450 grams is a pretty good price, for 6 servings. The Canada’s Food Guide has 75g of protein as a serving siz; we generally use 100g as our guide which is plenty. I’ve never had Chinese steamed fish but your recipe and description are compelling BFN, I’ll have to try it. Thanks. Hi Eva, we definitely got a good deal on the fish. Hope you like the dish! Ooh, steamed fish. This looks delicious! Recently hake has been appearing in the local fish market, and I don’t buy it because I don’t know what to do with it. Maybe your recipe will help. Is it a mild fish? Hi Lulu, I love it because it’s a great alternative to cod. I’m not sure if people class this as a white fish because it’s flesh is slightly more pink but it’s not an oily one, that’s for sure. It’s quite delicate, which is why it’s perfect for steaming. Of course one of my absolute favorite dishes here! We eat Cantonese steamed fish almost once a week. Yours looks delicious. Yes my family used to eat this every week, and it’s almost compulsory to order this at a Chinese restaurant. My dad makes different flavoured soys to pour over the fish too. Love how you cook your fish – YUM:) Hope all is well with you and your recovery. Enjoy Your Weekend! I don’t have a steamer, do you think I can do this by cooking the fish in a parchment parcel in the oven? Hi, yes I’m sure that would work though I would suggest perhaps adding 1-2 tablespoons of water in with your fish before sealing the bag to help the ginger and spring onions along.